Note: The views expressed herein are those of the author and do not necessarily state or reflect those of the U.S. Chamber of Commerce Foundation, the U.S. Chamber of Commerce, or its affiliates. The circular economy – an economic, performance based model focused on designing and manufacturing products, components and materials for reuse, remanufacturing, and recycling – promises big opportunities for the private sector to drive new and better growth and accelerate innovation. Shifting to the circular economy could release $4.5 trillion in new economic potential by 2030, according to Accenture forecasts. But how do we take the vision of a circular economy – which imagines a world without waste – and translate that into profitable and scalable action and best practice? We are pleased to release this second circular economy case study report featuring examples of how the private sector is doing just that – translating circular aspiration into action that drives greater resource productivity improvements, eliminates waste and inefficiency, and contributes to a stronger, more competitive economy. Why is moving to the circular economy important? The linear take-make-waste economy is no longer sustainable. Resource constraints, rapid population growth, price volatility, uncertain commodity markets, shifting consumer preferences and attitudes, and more are prompting a shift to the circular economy—a more viable and profitable alternative to the linear model that decouples economic growth from resource constraints. As you will learn in this report, companies of all sizes from across a variety of sectors and industries are embedding circular principles throughout their core business and value chains, helping them accelerate innovation and progress that enhances the bottom line, supports vibrant cities and communities, and protects or improves ecosystems. At the U.S. Chamber of Commerce Foundation, we provide a pre-competitive environment to learn, share, network, and collaborate to drive progress and achieve a circular economy. It is our goal you will find in this report new inspiration and tangible solutions for mainstreaming the circular economy in your organization and bringing those approaches to scale. “The Circular Design Guide” is a free, online resource developed by the Ellen MacArthur Foundation and IDEO. We believe it taps into an emerging appetite among industry leaders for an alternative, restorative, and regenerative approach to business that creates new value and delivers long-term prosperity. Transitioning to the circular economy will be one of the biggest creative challenges of our time. We believe design thinking is an ideal approach for tackling such a complex, systemic, ambiguous challenge. Created for mainstream innovators, entrepreneurs, and intrapreneurs, “The Circular Design Guide” aims to raise awareness of the circular economy, nurture a “systems perspective,” and share practical innovation methods. We hope these will galvanize readers to start designing tomorrow’s breakthrough businesses. Who did we develop this with? We prototyped the guide with leading global corporations, entrepreneurs, design and circular economy experts, and over 400 students worldwide who were studying at the cross section of business, design thinking, and the circular economy. “The Circular Design Guide” is designed for different levels of experience, and for any stage in the innovation process. It includes a brief introduction to foundational concepts of the circular economy, as well as how to shift mindsets, practical design tools, and additional resources. In our introduction of the guide, IDEO’s CEO, Tim Brown, shares his perspective on the importance of the circular economy, and why designers and innovators should be excited about the opportunities for disruptive technologies to create new value, and for tackling the problems that plague traditional businesses and social institutions. We explain about material, nutrient, and data flows, and why they’re central to more resilient, healthy companies and societies, before inviting readers to explore the mindsets and methods to equip and encourage them to dive in. Designing for the circular economy involves completely rethinking our traditional, linear, “take­-make-- waste” model and replacing it with a new, circular, restorative one. We share how to shift our design mindset: for example by zooming out from a product end user to take into account the wider ecosystem of all stakeholders. Or, rather than “finished” products, thinking of the things we design as constantly evolving. And designing in ways that expands opportunity for everyone, like creating reusable materials. We’ve developed 24 methods, grouped in the guide into four areas, loosely aligned with the flow of a circular design process: Understand, Define, Make, Release. The methods include introductions (“Understand Circular Flows”) and helpful techniques for those struggling to engage their organization (“Circular Buy-In”). Some adapt traditional design thinking practices to circularity (“User-Centered Research,” “Rapid Prototyping,” “Circular Business Model”), while others—such as “Service Flip” and “Imagine New Partnerships”—have been created specifically. Wild-card methods—including “Learn from Nature” and “Regenerative Thinking”—are designed to inspire readers. “The Circular Design Guide” is packed with extras: interviews with designers; worksheets for each method; illustrative, inspiring circular innovation case studies; and links for helpful technical tools, such as material selection. Since launching in January, we’ve been delighted that over 150,000 people have explored the guide. We also have a thriving circular design LinkedIn community of 5,000-plus members (via the guide) who actively share their insights and experiences designing for a circular economy. Moving forward, we intend to nurture and work with our active circular design community to co-create and evolve the methods and develop circular design education for business leaders. THE ELLEN MACARTHUR FOUNDATION was established in 2010 with the aim of accelerating the transition to the circular economy. Since its creation, the charity has emerged as a global thought leader, establishing the circular economy on the agenda of decision makers across business, government, and academia. The charity’s work focuses on five interlinking areas: insight and analysis, business and government, education and training, systemic initiatives, and communication. IDEO is a global design and innovation firm. For more than 30 years, IDEO has helped create positive impact through design by taking a human-centered approach to helping organizations in the public and private sectors innovate, grow, and bring to market new ideas. We partner with leaders and change agents to identify new market opportunities, and to design and launch innovative products, services, ventures, and brands. Imagine giving your living room a makeover using a bright new coat of paint...made from trash. Fiction? Not anymore. That is the genesis of Enerkem’s revolutionary idea: developing a disruptive technology that uses an abundant resource available everywhere—non-recyclable waste—as feedstock to manufacture renewable chemical intermediates that find their way into everyday products, like paint. Cities all around the world are struggling with a huge challenge when it comes to waste management, and they are desperate to find new ways to reduce waste sent to landfills and incinerators. In addition to the environmental problems associated with these practices, it is becoming increasingly difficult to permit new landfills or incinerators, owing to more stringent regulations and considerable opposition from the public. Enerkem is setting a new standard in smart waste management. By using municipal solid waste as a feedstock instead of fossil- or crop-based products, and recycling the carbon contained in trash to produce renewable chemicals and biofuels, Enerkem’s proprietary technology provides a cost-effective, sustainable alternative to the challenges associated with waste disposal for communities all around the world. Enerkem’s solution helps accelerate advances toward a circular economy where waste becomes a resource to make everyday products greener. It equally answers the question of how to dispose of rapidly accumulating non-recyclable and non-compostable garbage, while preventing greenhouse gas emissions from waste buried in landfills and creating value-added products from otherwise useless trash. Today, Enerkem’s facility in Edmonton, Alberta, is the world’s first commercial biorefinery of its kind to use municipal solid waste to produce biomethanol and cellulosic ethanol that will meet low-carbon fuel standards. The facility is the result of more than a decade of efforts to scale Enerkem’s technology from pilot and demonstration to full commercial operation. As part of our 25-year agreement with the City of Edmonton, the advanced biorefinery will process some 100,000 dry tons of sorted municipal waste per year. Enerkem uses its exclusive technology to transform that household waste in fewer than five minutes to produce a synthetic gas and convert it into advanced low-carbon transportation biofuel—enough to fuel over 400,000 cars on a 5% ethanol blend. The City of Edmonton is currently diverting more than half of its residential waste from landfills, primarily through recycling and composting. Enerkem’s facility will help the city increase that diversion rate to 90%. In turn, biofuels also help reduce greenhouse gas emissions by approximately 60% when compared with fossil fuel production and landfilling. Driven by the demands of the circular economy, Enerkem is developing its first European project with a consortium led by AkzoNobel and a number of strategic partners in the Port of Rotterdam in the Netherlands. The planned facility will provide a sustainable alternative to incineration. It will manage twice the volume of the Edmonton facility, processing up to 360,000 tons of refuse-derived fuel, waste plastics, and waste wood into up to 220,000 tons per year of low-carbon, “recycled” biomethanol. Under new proposals in the Netherlands, waste that is converted into new products will qualify as “chemical recycling”' and count toward recycling targets. Using innovative clean technologies can help communities meet their local waste diversion objectives and regulations while achieving federal advanced biofuels mandates. Enerkem’s modular and scalable manufacturing approach allows for efficient deployment as turnkey projects or as joint ventures with partners. In 2017, the company will begin the construction of a new facility in Varennes, Quebec. It is also developing similar projects in the United States and elsewhere around the world. Enerkem reduces waste destined for landfill and incineration, offsets dependence on fossil fuels for transportation, and helps meet low-carbon fuel mandates. Additionally, each Enerkem facility creates high-quality green jobs and stimulates local economies while also helping solve some of today’s most pressing environmental challenges. Now that’s the way to drive tomorrow. Artwork created from donated copper from Intel. Along with Intel’s passion for innovation, our founders instilled a strong commitment to environmental responsibility. We continuously strive to improve energy efficiency, reduce emissions, and conserve resources throughout our operations. Intel has a decades-long legacy of pursuing sustainability through environmentally responsible operations and innovative technology solutions. Intel has set a goal to recycle 90% of its non-hazardous waste and divert all hazardous waste from landfills by 2020, and since 2008, we have recycled 75% of the total waste generated from our operations. As part of our waste management strategy, we work to upcycle our waste material, moving beyond incineration and landfill to recycle, recover, and reuse. Finding value in waste material helps to reduce our environmental footprint, potentially reduce costs over time, and even generate revenue. This case study explores various efforts that have been employed to reach Intel’s environmental goals. In 2003, Intel developed an on-site electrowinning system that captured and recovered solid copper for reuse (as opposed to off-site disposal) from an aqueous waste steam generated from semiconductor manufacturing. Using copper seed media and electrical current to initiate a transfer of the ionic copper in the waste solution into elemental copper, the process eliminated the need to transport the low PH copper plating waste. The system yields valuable copper that can readily enter the metals market supply chain for reuse in other industrial or commercial applications. This copper recovery process has been replicated at our microprocessor manufacturing sites, and over two-thirds of the waste was recovered in 2016. High-purity copper waste generated from our factory equipment also serves as a raw material supporting the arts and fostering creativity. Over the past decade, Intel has donated over 1,000 pounds of copper targets, which have been used by students to create sculptures at the Herberger Institute for Design and the Arts at Arizona State University. In 2012, Intel converted a factory to accommodate a larger silicon substrate moving from a 200 millimeter to 300 millimeter wafer size. This resulted in the generation of perfluoroalkoxy (PFA), an extremely pure and flexible plastic. Our on-site segregation strategy decreased total disposal costs. Diverting the material from landfill, the piping waste was sent back to the original manufacturer for recovery and reuse, creating a “cradle-to-cradle” solution, and the manufacturer avoided purchasing raw materials. This management method has been adopted by multiple factories continuing to eliminate waste at our sites. The semiconductor manufacturing process requires the use of ammonium for cleaning. Waste ammonium is treated through a combination of air scrubbers and water treatment, producing ammonium sulfate, a non-hazardous byproduct. In 2013, ammonium sulfate from U.S. sites was directed to fertilizer manufacturers and used for enhancing alkaline soils. By finding a valuable market use for our domestic ammonium sulfate, as opposed to sending for treatment and subsequent landfill, we upcycled the waste, creating a feedstock that enters the circular economy, eliminating waste and reducing our disposal costs by more than 50%. Semiconductor manufacturing uses solvents extensively in the patterning process. In 2016, our engineers worked with one of our chemical waste suppliers to capture, recover, and sell over 650 tons of a valuable solvent from our mixed solvent waste. Through detailed analysis of the constituents in the solvent waste stream and understanding its value, we continue to minimize waste disposal costs while enabling other markets to use our solvents as feedstock in lieu of purchasing raw ingredients. Exploring novel ways to manage waste is not new to Intel, and with the help of our employees and partners, we collectively work to achieve our 2020 goal and significantly contribute to the circular economy by reducing waste, increasing recovery, and creating feedstock and new supply chains, while helping to decrease the extraction of virgin materials. Globally, more people live in urban than rural areas. Between continued population growth and urbanization, the world’s cities can expect to house about 2.5 billion more people by 2050. Having so many people living and working close together in a built environment can cause the temperature of a city to rise—creating what is called the “urban heat island effect.” The difference can be as high as 22 degrees Fahrenheit at night, increasing energy demand for cooling, and raising air pollution and greenhouse gas emission levels. One factor that can dramatically reduce the heat island effect is “cool roofing”—or a roof with high solar reflectance. Cool roofs have been around for more than 30 years and, in addition to helping to reduce the heat island effect, they reduce interior building temperatures, saving energy used for air conditioning and keeping building occupants more comfortable. Cool roofing for retrofit applications typically utilizes a thick (more than 0.5 millimeters), white, monolithic, solar-reflective elastomeric coating—made from either acrylic, silicone, or polyurethane resins—that is applied on top of multilayered flat or low-sloped roofing systems. In addition to reflecting sunlight, the coating provides some protective and energy management properties. It can be applied with a roller, brush, or sprayer. Energy savings from cool roofs vary depending on local climate conditions, the building’s operating system and internal conditions, the roof surface area, and the building’s roof assembly design and construction. Dow (or its subsidiaries) has been conducting studies of reflective roof coatings since 1981. More recent modeling and case studies indicate cool roofs achieve average energy savings of 4.6% in Barcelona and 19.2% in Dubai. A 2004 Texas A&M study indicated savings averaging 20% in California cities. It is estimated that in the United States alone, about 8 million tons of roofing waste ends up in landfills, taking up a substantial portion of the space. Because cool roofing can be applied directly over asphalt, single-ply, and other roofs, it can dramatically decrease landfill waste worldwide. Cool reflective roof coatings have been recognized by the U.S. Green Building Council’s Leadership in Energy and Environmental Design as contributing to reducing the heat island effect. And companies like Dow continue to innovate to improve the technologies with advances like Dow’s recently released CENTURION™ roof binder, which uses cross-linking technology to improve elastomeric roof coating performance when water ponds on the roof. Essentially any flat or low-sloped roof has the potential to be retrofitted with cool roofing. Demand for the technology is growing in North America. Demand is also growing in many other areas of the world—including warm climates, where the possible benefits are greatest. Dow is collaborating with several governments, associations, and non-governmental organizations to raise the profile of cool roofing and help educate the industry about the technology and encourage its use. As more building owners and communities understand the benefits of this technology, cool roofing could become tomorrow’s hottest recycling trend. 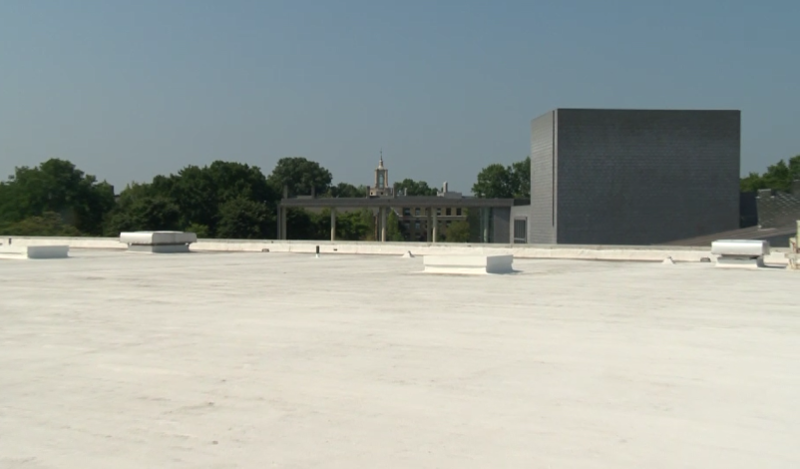 After struggling with bubbling and “alligatoring” of a four-ply asphalt roof on the Bakes Athletic Complex at Ursinus College in Collegeville, Pennsylvania, the roof was retrofitted with a reflective coating. Acrymax Technologies Inc. formulated the coating using Dow acrylic polymers. Thirty years later, the roof is still in good shape. With periodic recoating, the roof’s life could be extended indefinitely. The technology has since been used to extend the life of about 40 other campus buildings. Having built a successful glass collection and processing business in Salt Lake City, Momentum Recycling saw an opportunity for greater glass processing capacity in the Rocky Mountain region. Momentum’s new facility near Denver has the ability to profitably process more than 60,000 tons (300 million beer bottles) of glass each year so that it can be turned back into bottles, thereby reducing the need for virgin glass. Although glass is technically infinitely recyclable—making it a great candidate for a circular supply chain—it can be a challenging commodity to profitably sort and process as part of municipal single-stream recycling infrastructure. Nationally, fewer than one-third of all glass containers are recycled; furthermore, the recovery rate for glass could fall by 1%-4% if municipalities such as Houston and New Orleans continue to ban glass as an accepted material in their recycling programs. Since 2008, Momentum Recycling has successfully collected and processed glass in Utah. As Momentum’s leadership looked across the Rocky Mountain region, it was clear that many municipalities lacked a financially viable solution for recycling glass. Momentum saw a business opportunity to ensure that even more glass could be returned to use as containers and other valuable products. In 2015, CEO John Lair began conversations in the Denver area with potential customers and suppliers—with Rocky Mountain Bottling, a joint venture between MillerCoors and Owens-Illinois, the country’s largest glass container manufacturer, and with two area material recovery facilities (MRFs). Contract agreements with these entities became the foundation of Momentum’s Colorado business. Momentum pays MRFs a rebate for inbound glass—a notable economic benefit at a time when many MRFs pay to dispose of their glass. And, while the majority of glass goes to Rocky Mountain, Momentum has also innovated to find alternative markets—e.g., abrasives and filtration—for the undersized glass that a container manufacturer typically can’t take. Momentum purchased and updated a commercial property for its new operations in 2016. Leading European glass equipment manufacturer Binder + Co. was selected to design a state-of-the-art facility. The Momentum plant is now Binder’s largest installation in the United States. Financing from private investors, a state grant program, and Closed Loop Fund provided the necessary capital. All told, it took $11 million dollars to bring the project to life. The plant began taking glass at a small scale in December 2016 and has officially been operating since February 2017. While the plant team has encountered a few hiccups related to higher-than-expected moisture from the inbound material during the winter months and equipment challenges, it is off to a good start. The plant is processing more than 2,000 tons per month. It expects to scale to 4,000 tons per month by the end of 2017. At capacity, Momentum will process an amount of glass equivalent to a 2% increase in the national recycling rate for glass, at a higher quality that saves energy and reduces GHG emissions for end-market manufacturers. Glass manufacturing has seen limited growth in recent years. Momentum’s entry into the market could signal a shift for glass manufacturing by increasing the supply of high-quality feedstock and spurring demand for circular material. As Momentum scales its model, more high-quality glass can reach diverse end-markets. This demand, in turn, increases the value of glass for those collecting and sorting the material, making glass recycling financially viable for municipalities and MRFs. In Momentum’s circular model, the whole system benefits. One of the most impactful changes is coming soon and will land right under your feet. At DSM we support the move toward a circular economy to address resource scarcity and stimulate business growth. We recently formed a joint venture with Niaga® to develop carpet manufacturing technology that enables full carpet-to-carpet recycling after use. The DSM-Niaga® partnership is an example of the benefits that are realized when large corporations and small startups with similar values and visons for the planet join forces with a purpose in mind: Do something meaningful for the benefit of society. As a result of this partnership, there is an entirely new flooring category known as unified soft coating and a unique new product, AirO, produced by Mohawk. The carpet itself offers the same quality and price point as conventional carpets. AirO, however, comes with additional advantages—it is much easier to install and does not emit any noxious fumes or adversely impact indoor air quality. Perhaps the best difference is what happens after the useful life of the carpet is enjoyed: Conventional carpet gets shipped to a landfill; carpeting made with the Niaga® Technology can be sold back to the manufacturer, and turned into new carpet. Hence the name “Niaga®”—the word “Again” spelled backward—as in true circular economic fashion all materials can be used again, and again, and again. . . . In scaling up the technology, DSM partnered with LACOM GmbH to develop a commercial-scale laminating machine based on the Niaga® technology, with DSM’s engineered adhesive. The machine uses up to 90% less energy than mainstream lamination processes and reduces water use to zero. Unlike a regular carpet, a carpet made with Niaga® technology does not contain any latex, PVC, calcium carbonate, or bitumen. The absence of any other ingredient besides polyester makes the material 100% recyclable. One of the advantages for consumers and installers alike is that it is safer than carpeting made with latex, there are no VOCs (volatile organic compounds), and there is no dizzying new-carpet smell. Another advantage is that it is lighter and more flexible than carpet that is currently on the market, making it less expensive to transport. Carpeting made with this advanced technology enables effective resource utilization throughout the process, but it is best demonstrated at the end of the carpet’s life cycle, because it can be remade into a new carpet of the same size and of the same quality, without using any virgin raw materials. A key milestone in the launch of this new carpeting technology was finding the right partner to produce the adhesives. It took a lot of time and energy before the partnership between DSM and Niaga® began. The next key milestone was to scale up production from 10 inches of carpeting produced per minute to 30 feet per minute. Today, the most significant challenge ahead is the transition from a profitable but 50-year-old technology to the latest technology that generates value for everyone involved, including the recycler. Niaga® redesigns everyday products from the ground up for full recyclability. The first product that came to market is carpet. The only way Niaga® could make this happen was by drastically reducing the complexity of materials used in carpets. The result is a carpet made from only one material, making it fully recyclable in new carpets after use. By surprise, the simplification offered so much more: faster installation, resource-lean production, healthier indoors, and easier cleaning, to name a few. This makes us curious what would happen if other everyday products are redesigned from the ground up by DSM-Niaga®. As a leader on the Dow Jones Sustainability Index, DSM is already investigating the potential for the Niaga® technology to enhance our product portfolio and those of our customers. Extending the life cycle of products beyond one singular use is critical to societies’ long-term success. To achieve this, however, we must shift how consumers and businesses purchase, operate, and create guests’ experiences. Through Travel with Purpose, Hilton’s global corporate responsibility strategy, we have been investing in partnerships and innovative, practical solutions to help build more sustainable communities and to conserve natural resources. Our sustainability work ranges from targeted efforts to reduce food waste to providing customers with more sustainable menu options to driving water stewardship throughout our value chain. We are also providing nearly 5,000 hotels around the globe with real-time modeling information to conserve natural resources. Environmental sustainability is particularly important in the travel and tourism industry, as we have a direct stake in ensuring that guests want to travel to the locations where we have properties. For many of our hotels, the natural environment is fundamental to their appeal. We know that environmental stewardship can have a profoundly positive impact on business success. We believe in the principle of the circular economy—that it is possible to design our operations to be restorative and regenerative, and that by doing so, we can build economic, natural, and social capital. The United Nations (U.N.) designated 2017 as the International Year of Sustainable Tourism for Development. As an official partner of the International Year, Hilton will increase our focus on the U.N. Sustainable Development Goals where we can have the greatest impact: creating pathways to economic opportunities, building resilient communities, and preserving our environment. The travel and tourism industry is the world’s fastest-growing sector, projected to add over 86 million new jobs globally by 2026. This rapidly growing industry has the potential to positively impact global development by supporting changes in policies, business practices, and consumer behavior that can lead to a more sustainable tourism sector. Through mapping the social and environmental issues that our business impacts, we have developed a number of local, yet scalable, circular solutions that contribute to the Sustainable Development Goals. The circular solutions below represent some of the ways we are tackling global issues at every level. Maximizing the life cycle of a mattress: In our business, we buy and use millions of mattresses. To help mitigate the waste this produces, we have implemented a corporate-wide mattress recycling program. Through the program, an average of 95% of the mattress and box spring components are repurposed into new products. Steel springs become tools, automobile parts, and construction materials. The wood foundations become tempered flooring, mulch, compost, and other pressed wood products. The foam can be recycled for use as insulation or carpet padding. During the manufacturing process, all remnant scraps of ticking, foam, wood, steel, and plastic are recycled, as are all crating materials for inner springs. As part of this program, we have committed to buying new mattresses manufactured with recycled materials and sustainably sourced wood. Promoting hygiene by repurposing soap waste: We have identified a key strategy to divert waste and help address the global crisis of hygiene-related deaths. Soap is an unavoidable offset of our business, and our guests are often curious about what happens to the half bar of soap they leave behind. After years of strategic support and investment, we now have a soap recycling program at over 1,600 of our hotels. The hotels ship their partially used bars of soap to a facility where our partners repurpose them into new bars and then donate them to low-income communities. Through this program, we are reducing waste output while also contributing to the local community and public health. Reducing electronic waste through television recycling: Televisions are the largest contributors to electronic waste and in a landfill they can leak harmful substances into the environment. At Hilton, we established a partnership with LG Electronics and Global Sustainability Solutions to recycle old televisions when we buy new ones. About 99% of television parts can be recycled into electronic parts, but currently only 18% of discarded televisions are recycled. At one hotel alone, this program yielded 11,340 pounds of waste that was recycled. Hilton is committed to protecting the environment by ensuring our television waste is repurposed and not contaminating the environment. In order to measure our impact, we leverage LightStay, our proprietary corporate responsibility performance measurement platform, to understand how our hotels are managing energy, water, and waste. Such measurements allow us to drive more circular improvements over time. Since launching LightStay, we have gathered more than seven years of global data that allow us to provide real-time feedback to properties to reduce the use of natural resources, create tools and trainings for hotels, save value by eliminating inefficiencies and waste, and improve our reporting to share best practices and reduce our environmental footprint. We continue to evolve and focus on business-wide circular solutions that align Travel With Purpose with the larger U.N. Sustainable Development Goals. As we shift away from the traditional linear life cycles of products, we are continually looking for innovative ways to incorporate circularity—from ongoing measurement and elimination of inefficiencies to innovating the guest experience and offering tangible alternatives that can change consumer behavior. The future depends on resilient, thriving communities, and we look forward to more collaboration with other companies, government agencies, and non-profit partners on circular solutions that can have a collective impact. At Johnson Controls, our conventional automotive batteries have been designed so 99% of the materials can be reused. Each time a customer needs a vehicle battery replacement, he or she can return the old one—often to the same vendor providing the new battery. Johnson Controls then collects those old batteries and turns them into new batteries. Our circular thinking, coupled with a one-for-one product exchange of old product for new, has enabled us to establish one of the world’s most successful examples of a circular economy and continues to transform how we approach our work. With a circular economy, a supply chain starts and ends at the same place. We needed a fundamental paradigm shift to look at the end-of-life of a product not as waste, but rather, as a critical source of supply for new products. To fully enable a circular economy, products must be designed with materials that can be economically and responsibly recovered or repurposed. By thinking about the life cycle of the raw materials as opposed to just the finished product, we found unexpected financial, economic, and social benefits. Logistics are no longer one-way—they must be ideally managed as an entire system to manage the flow of new and used materials at the same time. Additionally, careful planning and execution are needed to match the ability of recycling facilities to supply the manufacturing footprint. Managing the supply chain. Since old batteries are used, we collect old batteries in a season that’s different from peak battery sales season. Learning how to manage the timing and logistics of this circular supply chain is a unique opportunity we’ve addressed and continue to refine. Continuing to increase recycling rates. Even though we already have achieved very high recycling rates, we’re not done yet. There are always more batteries to collect. As such, the opportunity to increase the collection rate to 100% is a goal we’re committed to achieving. It enables a more resilient, manageable, and visible source of raw material supply. Since the raw materials we use largely come from within the geographies we operate, we have diverse supply sources. Our closed-loop supply chain and reverse logistics network reduces the need for hundreds of thousands of additional transportation miles each year. Recycling batteries creates jobs and economic development for our suppliers, our communities, and our own operations. Recycling batteries in our circular supply chain also reduces human health risks associated with improper battery disposal or handling. Our employees are engaged and inspired by our work on a circular economy. The reuse of the metals from used batteries results in 99% fewer greenhouse gas emissions than processing primary ore from a mine. The use of recycled plastics uses 90% less energy than processing virgin plastic made from oil or natural gas. Reusing materials in our own operations reduces waste. Our vision is a world where 100% of vehicle batteries are recycled. Working hand in hand with customers, suppliers, and logistics partners, Johnson Controls created a circular supply chain that has ensured hundreds of millions of batteries have been properly recycled and materials are recovered for use in new batteries. We are excited to take the next step and explore how to increase battery recycling rates for traditional batteries and new battery technologies. But our commitment to a circular economy is not confined to batteries. Across our business, we look to extend life, remanufacture, and recycle. For example, we recirculate our Tyco Retail Visual Source Tags, which are security tags used for products such as apparel, which helps reduce resource use and waste. We also help refurbish certain building equipment to extend its life, and we help our building customers reach their goals on waste and material reuse. As part of our Johnson Controls Manufacturing System, we reduce and then reuse materials including scrap metal, plastic, and water, seeking to minimize waste. We will continue to integrate circular economy principles into our business in partnership with our suppliers, customers, and stakeholders. With over 640,000 people traveling through the airport campus on a yearly basis and a record-breaking number of travelers in 2013, the facility required not only a flooring product with endless design capabilities, but one that was also durable, long-lasting, and sustainable. Powerbond, once again, proved to be the solution. Tandus Centiva’s Powerbond is a hybrid resilient sheet flooring, impermeable to moisture and 100% recyclable. Powerbond was first introduced 50 years ago, many years before the circular economy concept had been developed. It was designed as a high-performance product meeting the customer’s demands for something long-lasting and durable. This fits the model of circular economy by maintaining the highest level of value for the materials used in manufacturing for the longest period of time. Powerbond is the six-time winner and sole recipient of the Antron® Fiber Sustainable Flooring award. During the first Powerbond install at the Chattanooga Airport, Tandus Centiva was in the process of developing a carpet whose backing was made from 100% recycled content. That product, ER3®, was designed to make use of current Tandus Centiva PVC-backed products as well as other manufacturers’ products. This allowed for Powerbond to be sold as a recyclable and sustainable product, again, maintaining the highest value for the raw materials at end of use, a circular economy concept. “Sustainability-wise, the airport is trying to become the greenest airport in the world, and in doing so, we wanted a product we can put down on the floor, keep it for 23 years and at the end of those 23 years, be able to recycle it,” said John Naylor, the airport’s vice president of planning and development. All of the Powerbond that was removed from the airport terminal was recycled into ER3 modular carpet at Tandus Centiva’s third-party certified reclamation facility and placed into the new flooring that is now in one of the airport’s LEED-certified general aviation buildings. As the current circular economy model has been developed, the use of “good materials” has become mandatory. All materials in Powerbond have been assessed, allowing for the next generation of Powerbond to be reintroduced into new carpet with no concerns about material quality, and reducing our need for virgin raw materials. This fact contributes toward our 2020 goals: having 75% of our material from renewable sources and not contribute towards resource scarcity. It also helps in our goal for all manufacturing waste to enter into a closed-loop technical cycle of recycling. Approximately 46,000 pounds of material was reclaimed from the Chattanooga Airport. As we move forward with the circular economy concepts, it will be important to design products to allow for increased ease of de-construction. This will ensure that individual raw material can be held into an even tighter circle of value (i.e., fiber into fiber). However, considering products should be designed for durability, designing for deconstruction is a difficult task. Redesigning the manufacturing process will allow for new methods that can create more pure streams of raw materials during the recycling process. “Tarkett is moving from a linear economy to a circular model; we welcome partnerships with entities like the Chattanooga Airport supporting this new circular model,” said Diane Martel, Tarkett’s Vice President of environmental planning and strategy. Rubicon is bringing technology and data to the $1 trillion global waste and recycling industry, and thereby realigning incentives to divert waste from landfills and promote a more circular economy. A tech company at its core, Rubicon rejects the asset-heavy business model of industry incumbents that profit from frequenting landfills and the make-take-waste culture. Instead, Rubicon built a cloud-based technology and big data platform that connects customers with a network of independent haulers and municipal fleets to enable higher diversion rates, creative reuse of waste material, optimized truck routes and collection, job creation (rather than replacement), and the analysis and ability to act on detailed waste data. The traditional U.S. waste industry is dominated by three large incumbents that own landfill real estate and derive profit from maximizing volume in landfills and increasing trash pick-ups. These players are so dominant that American consumers, businesses, and even public works departments are often unaware of exactly what happens to their waste or even that they have a choice in waste solutions and the ability to collect verified waste data. As a result, $11 billion in recyclable materials are buried in U.S. landfills annually, and recyclable materials represent 46% of landfill material. Accelerating tech development and adopting a circular economic model, Rubicon began by growing its business and network at scale. Beginning in 2008, the company signed on multinational retail brands, convenience store chains, and food distributors as its first set of customers, and connected them with independent haulers with services ranging from waste and recycling to anaerobic digestion and composting. It also built out its sustainability solutions team, helping customers devise unique solutions for diversion and material reuse. Next, in 2016, Rubicon set out to bring these better waste solutions to “main street,” gaining the critical mass of the $40 billion small-and-medium business (SMB) waste market and bringing them into the circular economy conversation that was already under way with its national accounts. Today, Rubicon works with thousands of SMBs nationwide, from car dealerships to veterinary hospitals to craft breweries and more. In January 2017, Rubicon rolled out its Smart Cities offering and began implementing technology partnerships with the City of Atlanta, City of Santa Fe, and the City of Columbus, Georgia, with many more to follow later this year. These partnerships are enabling municipal fleets to track city waste streams like never before and make data-based decisions around route optimization, waste infrastructure, resident education, and other improvements. Today, Rubicon’s asset-light, tech-based approach to waste management realigns incentives with the customer and the environment—less waste to landfill, fewer pick-ups, and more savings for the customer. Furthermore, Rubicon’s technology is enabling independent hauling companies to grow their book of business and create jobs in Main Street America. Rubicon’s technology also optimizes truck routes, thereby reducing Greenhouse Gas (GHG) emissions and reducing hauler operating costs, and collects data for detailed waste analyses, comprehensive reporting, and establishing baseline metrics to enable customers to see and improve their waste and recycling habits. In 2016, Rubicon grew more than 200% and now provides waste and recycling solutions for more than 200,000 user service locations across the United States and 18 countries around the world. With data verified by Trucost, Rubicon provides its customers with detailed waste data to enable more educated, circular decision making. These data are altering behavior at the waste source, while also helping to build market capacity for non-landfill destinations. Looking to the future, Rubicon is already pioneering the Smart Cities movement and the industrial internet of things in the waste industry, incorporating analytics and machine learning to gather, analyze, and share big data and enable circular decisions. The company has more than 70 U.S. and global patents pending for its technology, including Rubicon’s proprietary “shake” technology that registers the vibrations of a waste truck, container volume, and weight of container when a pick-up is occurring. This calculates accurate landfill diversion rates and GHG emissions/savings from waste and recycling activities. In just a few years, Rubicon’s technology and innovative approach to waste and recycling are delivering operational savings and new revenue sources for Rubicon’s network, creating the business case for companies and governments to shift their perspective on waste management, make the case for more upstream evolution, and encourage more circular economic thinking. Researchers have found that when diners knew their food waste was being composted, they wasted considerably more than those who believed their food scraps were destined for the landfill. Rather than feel good about composting, what if we focus on practices that eliminate food waste before it’s generated? Reusing and recycling so-called waste is the crux of a circular economy—but if we eliminate food waste before it’s generated we make that circle even smaller. Every year, Americans waste more than 63 million tons of food; and over 80% of all food waste comes from consumer-facing businesses and homes. Once this food goes to the landfill, it releases harmful methane gases and plays a huge role in the global climate change battle. Aramark’s mission to Enrich and Nourish Lives means providing safe, nutritious, quality, and sustainable food is at our core. Our goal is to reduce food waste by 50% by 2030 from our 2015 baseline. This goal aligns with our recognition as a U.S. Environmental Protection Agency and U.S. Department of Agriculture Food Loss and Waste Champion. As a global food service provider operating in 19 countries, we make decisions every day that affect the environment. We know that small steps have a big impact on our approach to prevent food waste. For example, we purchase almost 600,000 cans of tomato sauce in the United States annually. If we leave 6 ounces of un-scraped sauce in each can, we could waste approximately 31,000 cans of tomato sauce every year. For us, waste prevention starts with measurement. We believe that what gets measured gets managed. That’s why we focus on stopping waste at the source by adhering to our food management process, which includes standards for ordering, receiving, preparing, serving, and tracking food production. And that means not wasting tomato sauce. To accelerate our waste minimization efforts, Aramark is working with LeanPath—a food waste prevention company—incorporating its industry-leading tracking and analytics platform into our 500 largest accounts. LeanPath’s technology enables real-time data and immediate actionable insights. LeanPath gives our frontline associates a look at our impact, and our results, increasing motivation to reduce waste. To date, 100% of our locations are trained on our Food Management Process and are consistently tracking food waste. Since rolling out LeanPath in 2016, across 161 sites we have reduced food waste by 44% on average and we avoided sending 479 tons of food waste to a landfill. At times, even with the best practices in place, there may be instances of overproduction. In these cases, Aramark’s Food Donation Program provides a safe way to donate unserved food to local food relief agencies, feeding those in need in our communities. And, in partnership with clients, we compost at many locations, further diverting organic waste from landfills. As a member of the Food Waste Reduction Alliance, we are reducing food waste by addressing the root causes of waste by making sure we are ordering accurately, preparing and serving carefully, and tracking what’s left at the end of the day. Our emphasis on food waste prevention is part of our commitment to environmental sustainability. Through Aramark’s Green Thread™, we focus where we can make the greatest impact through everyday practices, including sourcing responsibly, minimizing waste, and managing buildings and our fleet efficiently. As we continue to implement tools like LeanPath technology we expect strong progress in minimizing our environmental impact and reaching our 2030 goal. Danyi Qi, The Ohio State University; Brian E. Roe, The Ohio State University. Foodservice Composting Crowds Out Consumer Food Waste Reduction Behavior in a Dining Experiment. 2016. At Tetra Pak, we’ve known for some time that use of renewable materials can play an important role in reducing the strain on the planet’s natural resources. As more governments and businesses embrace the restorative circular economy model, the use of renewable materials—those natural resources that can be regrown or refurbished over time—from responsibly managed sources can have a transformative effect on our environment and our economy. As a global leader in providing food processing and packaging solutions, we have embraced circular economy principles along the entire life cycle of our products. When responsibly managed, renewable resources are the only long-term alternative for achieving security and “circularity” in supplies. That’s why we encourage and support the deployment of renewable materials wherever possible, starting with sectors such as packaging where solutions like ours are already available. Our ultimate aspiration is to produce all of our packages using only sustainably managed renewable materials. That’s been the driving force for pushing eco-innovation throughout our portfolio. Significantly, we are evolving in this direction without compromising the functionality or recyclability of the package. Bearing in mind the words of our founder, Ruben Rausing, who believed that a package should save more than it costs, our packaging innovation toward a circular economy is also about optimizing design to make food safe and available and to avoid food waste. Our motivation to move toward this transition is further informed by some simple and straightforward facts: 77% of consumers feel companies don’t do enough to help protect the environment. And 73% of consumers say they would pay 5% more for products in an environmentally friendly package. That’s enough of a signal for us to support the transition to a circular economy, and it’s part of what’s behind the introduction of our most recent eco-advancement, our Tetra Brik® Aseptic 1000 Edge with Bio-based LightCap™ 30. This new package is manufactured using a bio-based plastic film and cap, made from polymers derived from sugar cane. Combined with the paperboard, this lifts the share of materials from renewable sources in the package to above 80%. It is the first aseptic carton package in the world to receive the highest class of certification for its use of renewable materials from Vinçotte, the Belgium-based accreditation agency world recognized for assessing the renewable content of packaging products. Of the wood fibers we use in our cartons, 100% are sourced from Forest Stewardship Council (FSC)-certified or -controlled wood. In 2016, 65 billion of our packs, or 36% of cartons generated globally, were FSC labeled. In 2015, 15 billion of our cartons had bio-based polyethylene (PE) coating and 3 billion cartons on the market had bio-based PE caps. Those steps demonstrate our continued commitment to environmental innovation and providing customers, retailers, and consumers with the highest level of environmental performance for their packaging. How do innovations like these help the planet renew? Notably, from an environmental standpoint, we are using fewer resources and reducing environmental impacts, thus helping to preserve the planet for future generations. Bio-based caps offer 14% to 19% lower CO2 emissions compared with identical caps made with fossil-fuel derived plastic. But in the spirit of our vision to truly bring transformative eco-progress to packaging, we are designing these next-generation renewable packaging solutions with the entire life cycle in mind. Our focus on renewable inputs is not at the expense of end-of-life management. Our approach to optimized design also considers recycling and the existing recycling infrastructure. Not only are the bioplastics we use recyclable, but increasingly, we and other carton manufacturers are partnering on end-of-life strategies with companies like ReWall, which upcycles cartons like ours into sustainable, high-performance building materials. Mainstreaming the circular economy requires more than just good intentions. We believe commitments must be backed up with investments into pioneering approaches that drive real business solutions. Our vision for packaging in a circular economy? Renewable materials, sustainably sourced, and recycled. We’re closing in on that achievement and creating a blueprint that we hope other sectors can follow. As the world’s largest grocer, Walmart is working to reduce food waste from farm to fork. We have made significant progress in our own operations and have broadened our efforts by working with customers, suppliers, nonprofit organizations, and governments to improve the broader ecosystem of food waste prevention, with the aim of fostering a circular economy. We have adopted a strategy that looks to prevent food from being wasted at every step of our operations, which includes optimized forecasting and ordering; improved store fixtures; enhancements in our distribution centers, in transit, and at store level; and providing associates with tools and education on how to better care for food products. When food goes unpurchased by consumers, Walmart works to maximize its use and get food that is still edible to people and places that need it most. Through our food donation program in the United States, food banks and agencies pick up food that can’t be sold from Walmart stores, Sam’s Clubs, and distribution centers. Those organizations then distribute this recovered food to people in need. Since 2005, we have donated 3.3 billion pounds of food to such organizations, including more than 600 million pounds in our fiscal year ending February 2017 (FY2017). We use the United States Environmental Protection Agency’s food recovery hierarchy to look at food waste in our stores. At one point in our waste reduction journey, we found that recovery of inedible food was one of our biggest remaining challenges. What could we do with food that can no longer be donated to people? In 2008, estimating that food accounted for more than a third of our total compactor waste in the United States, we began to look for a recycling solution. Back then, there was little food waste recycling infrastructure in the United States, and the majority of haulers were not providing organics recycling as a standard service. Walmart recognized this was an opportunity to build a recycling network that could help drive organics recycling for our own sustainability initiatives, while also providing the catalyst for other businesses to be able to implement their own organics recycling programs in areas where opportunities had not historically existed. Walmart’s organics program was launched in 2009, and within a year we had 300 outlets and a network of 46 haulers supporting the program. By the end of 2012, stores and clubs were seeing a year-over-year decrease in organics recycling volumes as we gained more visibility into our food waste streams and were able to drive more food donations, as well as prevent more waste upstream. In 2016, through a network of 78 haulers and 352 outlets, the majority of our recycled food waste helped create processed animal feed, followed by commercial composting, with a small amount going to anaerobic digestion. Since inception, the organics program has recycled the equivalent of over 25,000 semi-truck loads of inedible food, and we continue to focus on finding ways to reduce the amount of waste generated. Walmart’s international businesses are also working on embracing the concept of food waste prevention and diversion. For example, in Mexico, we piloted a program for collecting inedible fruits, vegetables, and bakery goods for feeding directly to animals, diverting 300 tons of waste in our supercenter stores and Sam’s Club locations in FY2017. We anticipate expansion of this program to other formats in the next few years. Our Asda stores in the United Kingdom are recycling food into energy by sending inedible, unsold food to anaerobic digestion plants, where it is broken down into gases that can be used as fuel and fertilizers. We have also broadened our food waste reduction efforts to include our customers and suppliers. We worked with suppliers in the United States to convert to a “Best if Used By” standardized labeling on all private-brand products unless a food safety or regulatory reason might prevent us from doing so. Use of the revised label is designed to help customers avoid confusion and prevent food from being discarded when it’s still good to eat. Also in 2017, as a part of Project Gigaton, we have encouraged our suppliers to set up food waste prevention programs in their operations, in supply chains, and with customers. No resource has more circular potential than water. When we maximize the potential of water by recycling, reusing, and repurposing it, the possibilities for its use are endless. Yet the way water is used—and abused—today is depleting available supplies of freshwater at an unprecedented rate. A dramatic shift in the way companies value water is needed to drive broader adoption and activation of circular water management to protect limited freshwater supplies and ensure its availability for future generations. Conservation alone is delaying an inevitable shortfall in freshwater supplies. Succeeding in a world that is increasingly constrained by both water availability and quality demands a different approach. Companies need to rethink the water cycle: to shift understanding and practices away from water as an inexpensive, “use and dispose” consumable good toward water as a valuable, recyclable asset. Using less water does not always equate to significant cost savings, given how underpriced water is in many locations, even where it is very scarce. Therefore, businesses often overlook its actual value to operation and underestimate its circular potential. The Water Risk Monetizer (www.waterriskmonetizer.com) is a publicly available online tool designed by Ecolab, Microsoft, and Trucost to help companies better understand the full value of water to their operations. The tool provides data and insights specific to an individual site’s water use to inform smarter water management decisions, including strategies to shift from conservation to reuse and recycling. Calculating and internalizing a water price that more appropriately reflects supply and demand dynamics and operational impact can help make the business case to change the way companies use and reuse water. Assessing the value of water—and the financial risk of water scarcity now and in the future, at one site and across an enterprise—involves multiple factors. The Water Risk Monetizer is an easy-to-use tool designed to help businesses quantify in monetary terms the water risks related to availability and quality. This first-of-its-kind financial modeling tool uses readily available information about water use, water costs, water quality, revenue, and production projections at a facility level to calculate the full value of incoming and outgoing water to a company based on local water scarcity. Using best-in-class local water basin data sets, economic techniques, and scientific methodologies developed by Trucost, the calculation takes into account tangible factors such as scarcity and quality as well as less tangible human health and environmental impacts of water use in a particular area to determine risk levels and display risks in comparison with current water costs. Understand the full value of water to an operation. Incorporate risk-adjusted incoming and outgoing water cost estimates into a facility budget, financial projections, business scenarios, and project proposals. Make the case for proactive water management strategies by utilizing risk-adjusted costs to demonstrate potential risk-based return on investment compared with conventional modeling using only market water costs. Identify operations or locations at greatest risk based on quantity and quality risks and growth projections. Prioritize water conservation and reuse investments based on site-specific water risks. Select where and how to increase production. Support development of a successful corporate water strategy: prioritize actions, minimize risk, maximize performance, and optimize costs by reducing, reusing, and recycling water. Inform corporate water goals with context-based water metrics. Microsoft’s data center in San Antonio, Texas, is located within the Leon Creek Watershed, an extremely water-stressed region that also presents water quality issues due to flooding, storms, and stream bank erosion. Data from the Water Risk Monetizer revealed that the full value of Microsoft’s water use at this data center, its risk-adjusted water cost, was more than 11 times greater than the current water bill presented by the San Antonio Water System. The numbers made the business case. Microsoft installed Nalco Water, and Ecolab company, 3D TRASAR™ Technology, which enabled the plant to reliably use recycled water instead of potable water, saving Microsoft more than $140,000 in water costs and avoiding 58.3 million gallons of potable water use per year. A trusted partner at more than 1 million customer locations, Ecolab is the global leader in water, hygiene, and energy technologies and services that protect people and vital resources. With 2016 sales of $13 billion and 48,000 associates, Ecolab delivers comprehensive solutions and on-site service to promote safe food, maintain clean environments, optimize water and energy use, and improve operational efficiencies for customers in the food, health care, energy, hospitality, and industrial markets in more than 170 countries around the world. For more Ecolab news and information, visit www.ecolab.com. EILEEN FISHER’s commitment to circularity and a future without waste is embodied by our evolving and innovative take-back and reuse program. We collect worn or torn EILEEN FISHER garments from our customers to ensure that nothing we create goes to landfill. We ask for our clothes back because we believe that their value doesn’t end with their first wear. We foster innovation so when our clothes can’t be reworn or renewed, they can be remade to start their journey all over again. EILEEN FISHER’s take-back program started in 2009 under the name Green Eileen as an initiative within the Eileen Fisher Foundation. The drive behind the program was to raise money for causes that we care about; as a promise, the profits from our resale program are donated to organizations supporting women, girls and the environment. We believe in the quality and timeless designs of our clothing, so we ask our customers to bring back their unwanted garments in exchange for a $5 credit per piece. This way, customers can extend the life of garments they no longer want, while knowing their contributions are positively impacting society and the environment. In 2015 as part of EILEEN FISHER’s larger commitment to sustainability, Green Eileen was moved from the foundation into EILEEN FISHER Inc. to allow for the program to continue growing. As Green Eileen developed into a successful resale business, an inventory of unsellable flawed product began to build. Optimistic that we could reclaim the value that remained within the high quality materials, the Makerspace was created in 2014 to avoid the need for overseas donations and/or downcycling. The Makerspace took over the inventory management of the unsellable product stream and began to explore local partnerships for donations and reuse workshops. In 2015, EILEEN FISHER partnered with the Council of Fashion Designers of America (CFDA) to create The Social Innovator Award which provided three design graduates a yearlong residency to create solutions for the damaged garments that were accruing. They spent months exploring ideas for renewing and remaking the damaged garments into new wearable creations. Approaching the design challenge through the lens of scalability, the Social Innovators identified recurring styles, materials and damages that allowed for the implementation of repeatable production processes. In the summer of 2016, The Social Innovator Award culminated with the debut of the first EILEEN FISHER Remade collection at a pop-up shop in Brooklyn, NY. By the end of the yearlong Social Innovator Award, we were seeing our path to sustainability a little differently. While our company goals have always been ambitious, as noted in our Vision2020 commitment to sustainability, the enhanced focus on our extended corporate responsibility revealed that this journey we’re on is actually a circular path. Now, in 2017 EILEEN FISHER has made the commitment to build a circular design system by developing the Social Innovators’ Remade project into a focused department within the company. Our take-back program has grown into a holistic and multifaceted approach to circularity that explores reselling, renewing and remaking post-consumer EILEEN FISHER garments. While we continue to resell the gently worn pieces as a means of supporting our most passionate causes, we have expanded the initiative to incorporate solutions for the flawed garments and their production scraps. At the start of 2017 we opened our EILEEN FISHER owned and operated Tiny Factory in Irvington, NY. Located in the same space as our east coast recycling center, and our Remade design studio, the Tiny Factory is an innovative approach to production that focuses on the re-manufacturing of our Remade collections by deconstructing, cutting and re-sewing flawed EILEEN FISHER garments that we have gotten back. Our take-back and reuse work employs 35 men and women within its two points of operation: Seattle, WA and Irvington, NY. Since the initiative’s inception in 2009, we have taken back over 800,000 garments and have donated $2 million to causes supporting women, girls and the environment. We view our customers as an integral part of this process; they are the key to the success of our circular commitment. We want to give our customers a place where they can find unique experiences and can make positive impacts with their decisions. While currently we only take back annually about 3% of the product EILEEN FISHER creates, with the help of our customers we will continue to work towards our ambitious goal of taking back 100% of our outputs. While we continue on our journey towards a circular business model, we recognize that we cannot shift the industry alone. EILEEN FISHER believes that business can be a movement, and at the heart of that movement is transparency and engagement. Our take-back and reuse program may not be a copy and paste business model, but it can be an inspiration for circular design and systems thinking. We invite partnerships and collaborations because we know that we are more impactful together. Executive Director, Product Compliance, Environmental Affairs and Producer Responsibility, Dell Inc. There is a looming shadow over the planet’s economy. The population is heading to 8 billion by 2025 and the ranks of the middle class will likely swell to 3 billion, with most of those people adopting the higher consumption patterns of their new cohort. This demographic challenge is entwined with resource constraints and the specter of climate change-related disruptions, painting a disturbing picture of the future. Forward-thinking companies, however, recognize there is a business opportunity not just to “do good,” but also to make money—estimates show a full-fledged shift to the circular economy could add $1 trillion or more to the economy. For this shift to happen, however, businesses need to move from theory to practice at scale. It would be a mistake to believe that Dell one day decided to “go circular.” It was an evolution born out of a long-standing commitment to being efficient with roots in our direct sales model and an emphasis on energy efficiency. For years we incorporated recycled-content materials into product designs. We also had a strong global take-back program that recovered many tons of materials from end-of-life products. Eventually, the question became: why not use the plastics we recover as a raw material for our products (instead of buying recycled-content plastics on the open market)? We conducted a feasibility test to understand how we might use some of these plastics. After (much) trial and error, we established a formula that allowed us to take plastics recovered from e-waste through our recycling programs, mix it with virgin plastics, and mold this into new parts. In 2014, we launched the first computer made with closed-loop recycled-content plastics in a process certified by UL Environment. The process led to an 11% smaller carbon footprint (even with moving the recycled plastics from the United States to China) and a natural capital net benefit of $1.3 million annually, according to a study by TruCost. The next step was to begin scaling the project. This meant increasing inputs (we now source via both our Reconnect Partnership with Goodwill and our Asset Resale and Recovery services) and expanding the product lines in which we used closed-loop plastic (we now have shipped 11 million pounds of closed-loop plastic parts for 91 different products)—all with a cost savings of approximately $1 million. With the success of our closed-loop project, we began looking at other ways to engage the circular economy. In addition to our longstanding use of open-sourced recycled-content plastics and sustainably sourced packaging materials like molded pulp, bamboo, and even mushrooms, we have added reclaimed carbon fiber as a circular material and are moving quickly toward the “run” phase with it. We have used nearly 1 million pounds of the material, giving it a second life and keeping it out of landfills. We also have launched an ambitious project to use ocean-bound plastics as an input for packaging materials. By collecting this material on beaches, waterways, and other coastal areas, we are keeping it in the economy and out of the ocean (approximately 8 million tons of plastic flow into the oceans annually). The true measure of progress with ocean-bound plastics, however, isn’t just scaling our own use (we have now committed to using 10 times more than we used this year by 2025). We recognize we will never use 8 million tons of ocean-bound plastic annually—so we are building a coalition of likeminded companies to help build out a supply chain for the material and open-source its use. So far, we’ve been able to demonstrate with multiple materials that a circular approach can meet our customers’ expectations for performance and aesthetics, reduce our reliance on “linear” resources, and save us money. A crawl-walk-run model, in which you determine feasibility, test in a pilot project, and then scale broadly, is an excellent way to begin the shift to the circular economy. Use the success of a small (walk) project to build traction and keep cross-function groups interested and engaged. Look for the shared value solutions—it’s called the circular “economy” for a reason and it’s not going to succeed if businesses cannot make money when they start to scale solutions. Most materials used to make clothing are not recyclable today. Because of this, 12.7 million tons of textile waste is sent to landfills each year in the United States. While the US has some systems to extend the life of clothing, such as Goodwill, fewer than 20% of clothing donations made to charities are resold there. About 45% of clothing donations are exported by for-profit traders to developing countries around the world. In 2013, the United States exported about 860,000 tons of secondhand apparel to developing countries. The market for the unloading of used apparel is shrinking though, as the East African Community has banned the import of used apparel from western nations starting in 2018. The issue is quickly becoming a domestic one, as textile waste is the fastest-growing component of municipal landfills. The system is linear and it is broken. The Renewal Workshop was created to change the paradigm of this linear system and to create a circular economy for the apparel industry. This case study will outline why this is important and how it can be done, along with the impact on the environment and on sustainable manufacturing jobs. The apparel industry operates under a linear economy. Apparel comes from natural fibers or synthetic ones derived from fossil fuels. These fibers are spun into yarns, made into fabrics and then apparel, and used. At the end of that use there is no system to capture and recover the resources already invested into those clothes. Today we call it waste, but in a circular economy that “waste” material is ready to go on to its next phase. The idea of “next phase” is critical when thinking about a material, where it is in its life cycle, and where it goes next. It might be something that moves quickly; take, for instance, an apple—its phases could be blossom, to fruit, to food, to compost, to soil, to nutrients, and so on. Something like a textile, however, could have a slower path—seed, to cotton, to fiber, to yarn, to fabric, to sweatshirt, and stay at sweatshirt for 20 years or more. It then could become a rag, fabric woven into carpet, and then shredded and recycled into a new yarn. The Ellen MacArthur Foundation laid out a framework and collective vision with its definition of a circular economy. When reading the Ellen McArthur Foundation Butterfly Framework, the emphasis needs to be on the inner circles. Either cascading the renewables or maintaining, reusing, redistributing, and refurbishing the technical nutrients. Apparel brands and retailers have the greatest tension between the linear and the circular economy. The current system for brands is designed to go in one direction—they make products to be sold to customers and they do not want them back. Their products come back to them, however, for a variety of reasons: returns, warranty, damages, or overstock. In the case of damaged product, an issue as simple as a missing button will triage a product to “waste” because apparel brands have no capability to fix the product here in the United States. Ninety-seven percent of apparel is produced outside of the United States, and so brands have no core competency in the manufacturing of their own product, let alone in repairing it. With no system to effectively deal with this unsellable inventory, the typical solution is shred and landfill. To help brands and retailers transform this linear process and move this unsellable inventory to the next phase, a system that uses the inner circles of the Ellen MacArthur Butterfly Framework—maintenance, reuse, refurbish, recycle—needed to be designed. The Renewal Workshop created that system for this next phase by partnering with apparel brands and retailers to recover value from their unsellable returns and excess inventory. Our Renewal System takes discarded apparel and textiles and turns them into one of three categories: renewed apparel, upcycling materials, or feedstock for recycling. These categories align with the Butterfly Framework, recovering the highest amount of value for each product. Renewed apparel sits within the inner cascades of the Butterfly Framework—using materials at their highest value for as long as possible. The clothing is cleaned using state-of-the art liquid CO2 technology and repaired in our renewal facility with the goal of getting as much product as possible back out into the market. Renewed apparel is sold back to the brand so they can sell it through their own sales channels, sold wholesale to retailers, or direct-to-consumer at http://www.renewalworkshop.com/. The Renewal Workshop e-commerce launched in February 2017, where one-third of the products received that can be processed have made their way for online sales. To ensure product quality The Renewal Workshop is the certified renewal partner of the brand and the accompanying label in the garment acts as a seal of trust and quality. The upcycling stream is made up of product that is deemed not to be renewable but contains materials that can be used to create entirely new soft goods and apparel. We serve as a supplier of upcycling materials as well as a manufacturer of our own and potentially other brands’ products. Upcycling or remanufacturing removes the need for new raw materials to be created—for instance, the fabric of a jacket becomes a new tote bag. Through our own efforts and in partnership with our network of recyclers and partners around the world, we are creating systems and new technologies to recycle apparel that cannot be renewed or upcycled. We take product at its lowest value—true waste—and turn it back into fiber, yarns, or new fabrics that can be sold back into the downstream supply chain to manufacture new clothing and textiles. This turns that zero-value waste into the valuable raw materials that the industry depends on, but with substantial environmental and financial savings. The focus for decades has been on making the apparel supply chain reduce its negative impact on the environment and improve its impact on human lives. Efforts in organic agriculture, recycled materials, and Fair Trade have all made incredible advances. Those efforts must continue, but must now include a focus on extending the life of a garment, as this has a significant effect on impact. WRAP, a U.K. nonprofit committed to resource efficiency, identified that if people were to use their clothes for an additional nine months, they could see footprint reductions of 22% less carbon, 33% less water, and a reduction in waste of 22%. The Renewal Workshop applied our own methodology to measuring the impact of renewed apparel by looking at life cycle analysis (water, carbon, toxics, and energy used) to make an original material combined with the weight of the garments diverted from landfills. In only six months of manufacturing, we have diverted 16,000 pounds of apparel from landfills and created an environmental savings equivalent to 89,000 gallons of water, 47,000 pounds of toxic chemistry, and the equivalent carbon impact of 11,000 gallons of gasoline. The positive impact on the environment is not the only aspect to highlight with The Renewal Workshop’s circular economy model. In the United States, there has been a strong focus on creating and growing manufacturing jobs. Manufacturing has been associated with the living wage jobs that created the middle class. Developments in globalization and technology have dramatically changed the landscape of manufacturing, where production lines are built to move volume through at the cheapest rate possible. In remanufacturing, or as The Renewal Workshop frames it, renewing, the work varies based on the specific problem at hand. Repair type and materials change with each garment, which means that a high level of skill and problem solving is required combined with the ability to be nimble and agile to drive efficient production. Technology can be used where processes are redundant, simple, and predictable. The Renewal Workshop has created eight circular economy jobs so far, which required adjusting skills and problem solving approaches. Our work is developing a new kind of workforce: one that positions communities that support circular economy work to increase the quality of jobs they provide to the community. The apparel industry is going through a transformative shift in part to the efforts of The Renewal Workshop. The infrastructure and services needed to take discarded apparel and manage it for the highest use creates significant positive environmental and human impact. By extending the life of materials already produced and preparing them as feedstock into new materials, brands and retailers now can start to do business in an economy that is truly circular. The Ramapo River Watershed is critical to the water needs of Rockland County, New York, as well as several communities in northern New Jersey. Changes in flow in the Ramapo River after various weather events are monitored by Rockland County Sewer District No. 1 to ensure groundwater stays at healthy levels. Certain months of the year have become especially dry, however, and the river’s sole-source aquifer shares its water with a local well system. The aquifer has struggled to provide water to the 1 million regional residents who depend on it in the tristate area. It needs support to continue being a reliable delivery system while meeting sustainable levels required by the Environmental Protection Agency (EPA). Rockland County engaged a thorough procurement process in search of a solution, but not just to keep the Ramapo River clean. The county had to configure its utility system in a way that addressed Ramapo and Hillburn, New York’s dependence on an often-unpredictable flow of groundwater. Rockland County ultimately selected Veolia Water Technologies, a solutions provider of Veolia North America, to design, build, and operate the Western Ramapo Advanced Wastewater Treatment Facility, a new 1.5M-gallon-per-day wastewater plant. Equipped with sequencing batch reactors, the plant extended the typical water aeration process and championed a unique type of microfiltration. This allows the county to treat effluent that normally wouldn’t return to drinking water standards set by the EPA. The best part is that this effluent then replenishes the Ramapo Valley’s groundwater aquifer. By denitrifying this wastewater and feeding it back into the river, the aquifer can rehydrate itself and provide for residents despite seasons that make it difficult. By incorporating new technologies in an otherwise conventional utility, Rockland County puts a natural resource into a closed loop—addressing a visible effect of climate change with a circular solution. Communities shouldn’t have to compete for clean water, and with this new reclamation plant, they don’t have to. Water is meant to be reused, but proper guidance is required to do this effectively. The Ramapo River aquifer can now reliably deliver clean water to a million residents in Rockland County and 280,000 across the state line in New Jersey. It’s a real measure for how creative solutions at the local level can improve the distribution of public resources regionally and contribute to the circular economy at the same time. The circular economy isn’t exclusive to clean-energy entrepreneurs or an “alternative” movement for conventional public works. On the contrary, it invites all utility systems to think differently about their role in addressing the challenges facing their community. The retail industry has a problem that we all play a part in. Every year, 15% of inventory is returned by consumers or deemed excess by retailers, and that number climbs even higher for online purchases. In the United States alone, 1 in 10 purchased goods is returned, and each year retailers take back an estimated 3.5 billion products (many of which go straight to landfills). This amounts to 4 billion pounds of waste annually in the United States. The traditional and extremely inefficient returns process is largely to blame. Returned items are shipped multiple times through a network of middlemen and distribution centers before reaching an end consumer or landfill. The process—part and parcel of the linear economy—is called reverse logistics, and it’s an process that has seen little innovation in decades. Optoro is tackling this problem with innovative technology, and works with some of the nation’s leading retailers and manufacturers to enable more circular and sustainable reverse supply chains. This case study highlights Optoro’s partnership with Groupon Goods, and the environmental benefits of replacing traditional liquidation with a high-tech reverse logistics platform like Optoro’s. Optoro began working with Groupon in 2014. Before implementing Optoro’s software (called OptiTurn) on site at its Hebron, Kentucky, fulfillment center, Groupon outsourced its reverse operations to third-party liquidators. Now, once a returned or excess product arrives at the center, it is immediately scanned into OptiTurn. Next, data and real-time secondary market information are used to instantly match and/or market each product to its optimal disposition—direct to consumer or business, recycling, return to vendor, or donation. Since the start of the program, over 1.5 million units from the Hebron facility have been processed through OptiTurn. To demonstrate the environmental benefits that Groupon has achieved using a smarter, technology-driven returns management system, Optoro developed an environmental impact model. The model estimates fuel savings and waste reduction for any retailer or manufacturer’s reverse logistics network. In 2016 the program diverted 223,750 pounds of retail waste from landfill (Figure 1[SG1] ) Decreasing reliance on liquidators reduced the number of shipments, which in turn reduced the likelihood of shipping damage, product expiration, or obsolescence. Optoro cut out the extra touches involved when reselling to wholesalers or resellers. The resultant transportation efficiencies reduced carbon emissions by 16%. In 2016, Optoro decreased fuel use by 32,212 gallons, the equivalent to 686,086 miles driven by passenger vehicles. Before using OptiTurn, an estimated 23% of inventory in Groupon’s reverse supply chain was disposed of or recycled. Using Optoro’s software, 88% of the returned and excess inventory in the reverse supply chain is resold to secondary consumers. Putting products in the hands of consumers means a longer product lifespan and less landfill waste. Figure 1. Total waste produced in supply chain before and after Optoro’s software. This initiative quantified one key conclusion: Retailers have the potential to drastically reduce waste and emissions in the reverse supply chain through the use of technology like a reverse logistics platform. Faced with this increasing but often-overlooked problem of returned and excess inventory, Optoro encourages sustainability and supply chain professionals to examine their processes for managing this inventory and assess whether they are focusing on efficient, streamlined systems that prioritize reuse and landfill avoidance. The concept of circular economy—a regenerative business model where resources are in use as long as possible, in contrast to the current linear “take-use-dispose” model—is becoming a bigger part of the sustainability conversation. UPS wanted to know how much of this conversation was turning to action in business and was keen to learn how others saw logistics working with the circular economy. To answer this, UPS collaborated with GreenBiz to ask over 5,200 sustainability experts and business leaders where they stood with the circular economy, and where they predicted the future would lead. While respondents reported exploring and adopting principles, they also shared data on the challenges they’ve faced in pursuit of the circular economy. Chief among those challenges—cited by 38% of respondents—is a strong business case. This business case is complex as adopting circular economy principles has to fully account for cost and complexity of logistics, disassembly, repurposing, remanufacturing, and more transitions for a company from the linear model. Compounding the business case, profit margins for all of the supply chain players in a circular economy must be equal to or better than what is possible with the linear model of “brand new” products being made to replace broken or obsolete items. Shortly behind business case, the logistics costs to reclaim used goods (36%) were cited as a top barrier to circular economy practices. This answered important questions for UPS: Where is our opportunity to help, and what are companies’ pain points that we can provide our global logistics expertise to? Logistics in the circular economy were a key concern overall, with 97% of respondents reporting logistics are important to the transition from the linear economy model. The solution for the “first mile” of reclaiming products and materials for future use was a high concern, which can be complicated for logistics providers and companies to adjust supply chains and modify value chains for returns. TerraCycle: TerraCycle reuses, upcycles, and recycles waste instead of incinerating or sending to landfills. This moves waste from a linear system to a circular one, allowing it to keep cycling in the economy. UPS has been working with TerraCycle since they launched, providing an easy, seamless returns process. People just log on to TerraCycle’s website, print a return shipping label, and drop off at any UPS location—UPS Store, Access Point location, etc.—and UPS handles the rest. Nespresso: Nespresso utilizes single-use coffee pods made from aluminum, an infinitely recyclable material. Nespresso found that its recycling options were complicated by inconsistent infrastructure around the United States. To expand the opportunities and increase convenience for customers, Nespresso partnered with UPS. Now, consumers are given prepaid return bags and can drop them off at any of the 88,000 UPS drop-off locations in 48 states or give them to any UPS driver. Through this partnership, Nespresso is able to reclaim more pods. The aluminum can then be used in new products, and coffee grounds are composted into high-quality soil amendments that go to landscapers, garden centers, municipalities, and homeowners. UPS believes strongly in the power of partnerships, and the ability we have to solve problems together for business and the environment. By working together, we can find ways that are better for customers, the environment, and business all around. To learn more about “The Growth of the Circular Economy” study and see the full report, visit ups.com/sustainability.